Just imagine the joy of eating a perfect hamburger patty with thin slices of cheese, fresh tomatoes, a bit of pepper and a ketchup between soft toasted seasame buns? That's why burgers are recognized as America's #1 food. Billions of hamburgers with a high protein rate are eaten every year. Summer is especially good for outdoor cooking activities with family and friends. Grilling patties and making burgers to celebrate the most nice days of the year is a perfect choice for this season. It goes without saying, that absolutely anyone can cook a burger as itâ€™s a very easy and fast way to satisfy your hunger. Moreover, you donâ€™t have to be an experienced chef to create a delicious meal that will make everyone compliment your skills. You only have to know a plenty of burger & sandwich recipes. Without the slightest hesitation, we can say that our recipes will make you the most popular person at all backyard barbecue parties or family dinners. 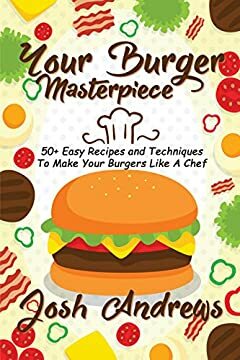 In this cookbook you can find any recipe from classic beef burgers, to turkey, to high protein chicken recipes, to lamb, to seafood and veggie burgers. Everyone can find something for his taste here. This book contains over 50 recipes that will make everyone rethink what a hamburger can be. So let's turn on the grill or pull out the skillet, and let's start the cooking!